Another International Incident comes again. In May, we’re throwing a dumplings party. I think this is my last post before I go to Melbourne and Adelaide for holidays. 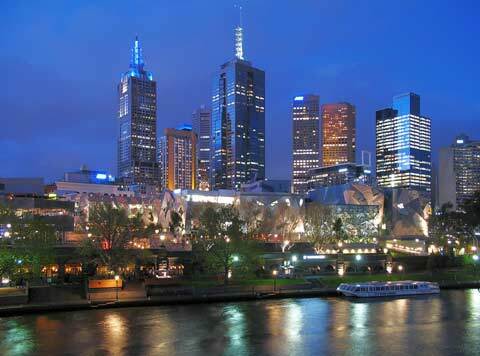 It’s been a long time I haven’t traveled to Melbourne and enjoyed yummy foods there. I’d catch up with all of you whenever I get access on internet. In this International Dumplings Incident, we also celebrate the birthdays of all May babies. Congratulations on Mardi, turning 40 on this special day, Divina Pe, moving to take up a job offer as well Shirley, Pam and Evelyne. All the best wishes to all of them. My post of this International Dumpling Incident focuses on sharing how to make a popular, famous Chinese snack, deep-fried wontons (jinlu yuntun 錦鹵雲吞), a kind of Cantonese dumplings. Originally, this snack was supposed to use any leftovers you got to cook the sweet and sour sauce. Traditionally, people would add squid/calamari and pork liver, yet I omitted them this time. This traditional snack can hardly be found in Chinese restaurants nowadays. Some old-fashioned Chinese restaurants might have 錦鹵雲吞 on their menu anyway. 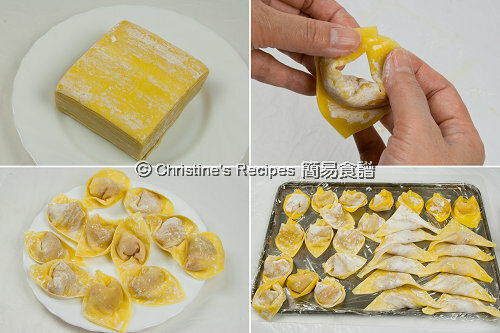 When it comes to cooking 錦鹵雲吞, don’t twist the wonton wrappers to seal the fillings as a parcel, but keep the wonton wrappers as flat as you can. The highlight is the deep-fried, crispy wonton wrapper dipped in the well-balanced sweet and sour sauce, not the filling. So, the fillings are kept to the minimum. This post seems to be a bit long. But don’t be threatened by its length. The wontons are easy to make and often turned to be kids’ favourite. Peel and devein prawns, rinse and wipe dry with kitchen papers. Make prawns meat about 170 grams. Cut each into 3 sections if it’s too big. Mix with marinade well. Put marinade into pork and mix well. Add prawn meat and combine. Chill in fridge for 20 minutes, covered with film wrap. Heat oil to 180C (350F) in a wok or a large saucepan, or until a cube of bread dropped into the oil browns in 15 seconds. Carefully place wontons in batches and deep-fry for 2 to 3 minutes. Lightly press the wontons down, once you place them in the oil, because the wontons float on the surface of oil and won’t be cooked evenly. Stir occasionally, and cook until golden. Remove with a slotted spoon and drain on paper towels. Set aside. Mix ketchup, white vinegar, sugar, Worcestershire sauce, salt in water. Heat oil in a wok (or frypan). Pan fry the prawns with tails intacted until colour changed. Set aside. Add more oil and sauté the onion over medium heat until translucent. Add garlic and shallot until aromatic. Toss in the capsicum and stir-fry until softened. Pour in ketchup mixture. Bring it to a boil. Add pineapples and BBQ pork lastly. You might like to adjust the taste by adding more sugar or water bit by bit to your liking. Season with salt. Add thickening and cook to your preferred consistency. Transfer into a serving bowl. Arrange prawns on top. Served hot with deep-fried wontons. Wonton wrappers (雲吞皮) look similar to the dumpling wrappers (餃子皮). The colour of wontons is yellow, whereas dumplings white. Try to buy those good quality wonton wrappers that are made by eggs. 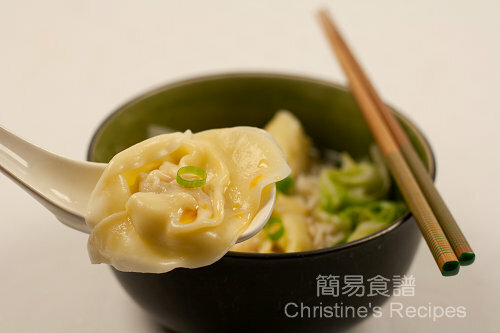 If you’d like to have wontons in soup, please refer to previous Cantonese wonton soup and cook the soup. Awesomeeeee! Enjoy yourself in Melb. I've never done wantons, you've done them so beautifully Christine! Have a blast! Fried wontan is nice. I love munching on these crispy snacks.....yum yum! 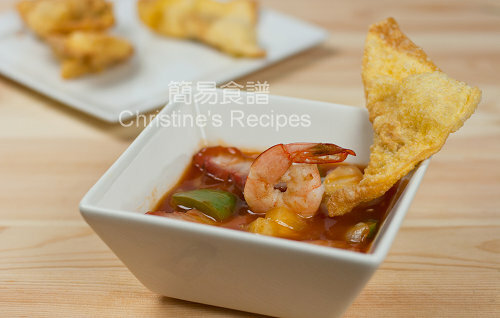 These fried wontons sound absolutely scrumptious and so good with the sweet & sour sauce, yum! You have here great tips for wrapping and filling the wontons for frying. I love to dip a great amount of sauce with a large surface of wonton skin. Have fun and enjoy your holidays : )! These look so crispy and crunchy and perfectly cooked! Beautiful photos too. Thanks for the detailed steps, I'll know where to look when I attempt to recreate your folding skills one day! 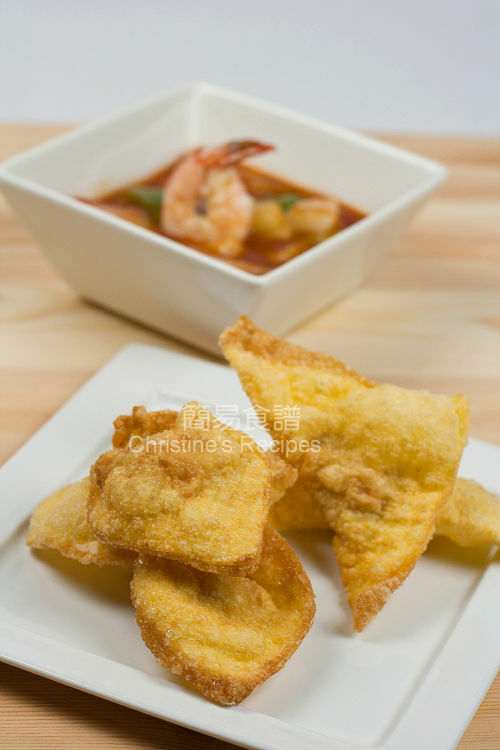 I love fried wontons- these look really nice and crunchy!! Yum! The sweet and sour sauce also sounds interesting- and so much better than the bright red sweet and sour sauce you get at restaurants! Are you coming to Adelaide? When, where and let's meet up if possible? I can show you around famous spots in Adelaide or if you want some quality family time, I can tell you the famous spots so you can gi with your family! Lemme know again!! These look great - I am a big fan of the fried version too. Thanks for the tips on wrapping - will try next time! Your wontons looks great. Your soup is so hardy compared to what we get in restaurants. Thanks for the bday wish! I like wontons...fried or in soup...they are both very good. Wontons are my favourite, and my kids love them too! I love the music on your video. I find folding the wontons very meditative and peaceful, and the music really highlights this. Your wonton wrapping skill is top-notch! Need to get a lesson from ya! Have a great trip Christine! Can't wait for you to come back and hear all about your trip. In the meantime, I'll drool over the dumplings. I usually do the parcel version in soup. Need to try the flat version for deep-frying :D...good tips! Am loving your fried wontons! They look so good!! These look great! I don't have access to wonton wrappers, so I am forced to make my own, but there are so worth a try. I am eager to try to sweet and sour dipping sauce. Yummy!!! Oh, I don't know which one I'd want first - they both look so appetizing! Both please . . . Have a wonderful trip! These wontons are fantastic! thanks so much for providing a detailed recipe and the video! I can almost the hear the crunch as you bite into them! The sauce looks just as good - great combination. Missed your message, sorry. I don't have any internet access except the hotel we stay provides us. Thanks for your offer. We would arrive at Adelaide tomorrow. Today, we're going to visit the 12 apostles. Your wontons are deep fried to perfection. looks yummy with the sauce and also served in the soup. Very nice Christine. Love that you made wontons in different ways. Have a nice holiday and eat some for me. I'm telling you...I could eat every single dumping I've seen here! They really do look delicious! I think the sauce might be my favorite part though! Keep up the great work and thanks for sharing! Thank you Christine's! Your post for this fried wanton really helps me alot. I should follow your tips to make this wanton since 1 of my friend ordered for Frozen Wanton for her Hotel Function this weekend. Tqvm once again!